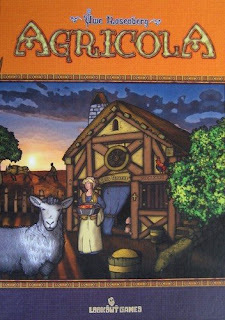 Agricola has scratched a nice itch for me that was unsatisfied by some of our other two-player favorites, which include Battle Line (which is a must-try for anyone who likes Lost Cities but could use more depth) and light war games like Nexus Ops and Battle Cry. Building a little farm is a fun activity, and there’s a pleasant level of player interaction in the “only one person may perform each action” mechanic. The other player can upset your strategy (either purposefully or inadvertently) even though the overall tone of the game is positive. I wonder how much of Agricola’s popularity and charm comes from its length. At the end of each game I wish I could go just another round or two, which makes me all the more eager to play another full game again.